This is the first game in the King's Quest series. For other games in the series see the King's Quest category. 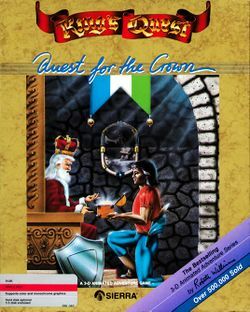 King's Quest: Quest for the Crown is a 1984 computer game, originally published for the IBM PCjr simply as King's Quest. The story and the general design of the game was developed by Roberta Williams. Williams was the chief designer of all official releases of King's Quest, working with the series all the way through to the last official release, King's Quest: Mask of Eternity. The game was re-released on September 19, 1990. This release is the "Enhanced" version of King's Quest. It uses the Sierra's Creative Interpreter (SCI) engine, the same engine used in titles such as King's Quest IV; while it still used 16-color graphics, it featured twice the resolution as well as music card support instead of the PC speaker. The Kingdom of Daventry is in serious trouble because its precious magical items have been stolen: a mirror which tells the future, a shield which protects its wearer against danger and a chest always filled with gold. King Edward the Benevolent (who has no other heir) sends his bravest knight, Sir Graham, to retrieve them. If he succeeds, he will become the next king. This page was last edited on 9 July 2016, at 19:36. This page has been accessed 8,240 times.